To reserve Gallery Box seating, including full box buyouts, please email EntertainmentCabanaSales@cosmopolitanlasvegas.comor call 702.698.6797. Or click on the link below to purchase tickets. Over the past decade, The String Cheese Incident (SCI) has emerged as one of America’s most significant independent bands. Born in 1993 in Colorado’s Rocky Mountains, SCI has since released 11 albums, seven DVDs, and countless live recordings from its relentless tour schedule. The group’s 25-year history is packed full of surreal experiences, epic moments, groundbreaking involvement and huge accomplishments. 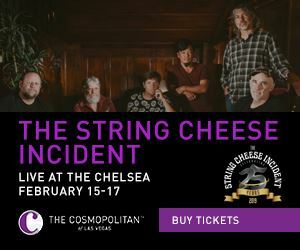 The String Cheese Incident has been recognized for its commitment to musical creativity and integrity, for its community spirit, philanthropic endeavors, and for its innovative approach to the business of music.